Not only is passion flower an eye-catching specimen to add to any garden, but it has also long been prized for its robust health and healing capabilities. Spanish explorers were the first documented Europeans to come across this vine in the mid 16th century, seeing the various elements of the flower as a representation of the Crucifixion of Christ and therefore as a symbol of Christ’s approval of their exploration. There, native people of the Americas used passion flower as a mild sedative and relaxing agent. It has also been used in Europe for centuries to treat pain, nervous exhaustion, inflammation issues, and heal bruises and cuts. Though the scientific evidence is slim, in the realm of natural healing and herbal remedies, passion flower is a well-known powerhouse. This plant was available for over-the-counter distribution in America as a sleep aid and sedative but was removed from the market in 1978 due to the spotty evidence regarding its safety and usefulness. Always check with your healthcare provider before starting a new supplement. Passion flower has proven to be extremely potent when used in combination with other calming herbs such as German chamomile, hops, kava, skullcap, and valerian. Various herbal supplements utilize the natural chemicals in passion vine for calming and relaxation. All the aboveground parts of the plant, such as steam, leaf, fruit, and flower can be ingested and used without harm. Note: Only buy certified organic passion flower tea, liquid extract, and capsules. Due to its calming and relaxing properties, many have used passion flower over the years as a method to relieve anxiety. It is thought to interact with receptors in the brain, and because of the compounds alkaloids “chrysin” and “benzoflavone” present in this herb, it has been found to increase GABA (gamma-aminobutyric acid) in the brain. GABA is a neurotransmitter in the brain, used to restore balance and decrease hyperactivity. 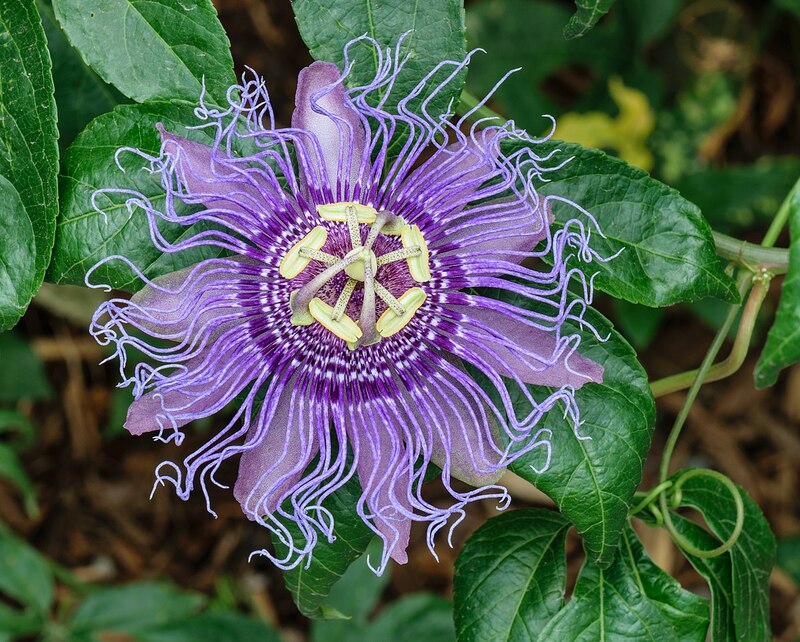 One study, performed on 60 patients, presurgery, discovered that those who received passion flower reported less anxiety than those who consumed a placebo. Passion flower is such a desirable option for anxiety sufferers because it soothes without affecting the respiratory rate or mental function like many prescription anxiety medications. It can also relieve headaches, muscle tension, as well as numerous other symptoms associated with anxiety disorders. Drug-based hormonal therapy can often cause more harm than good, as it is based on dangerously manipulating the hormone levels in a woman’s menopausal stage. Because of the dangerous side-effects associated with much of this invasive therapy, many women are turning to passion flower for relief, because rather than altering the body’s natural systems, passion flower works with the body to encourage proper function. It has been shown to relieve symptoms of menopause such as insomnia, hot flashes, night sweats, anger, and depression. This study proved the usefulness of passion flower, as well as various other herbal supplements such as anise, licorice, black cohosh, red clover, evening primrose, flaxseed, St. John’s wort, and valerian in reducing or even eliminating the effects of hot flashes. Because so many insomnia issues are related to anxiety, passion flower is thought to be an effective means of increasing depth and quality of sleep as well as clearing the mind and allowing relaxation. This herb is particularly beneficial when combined with valerian, as these remedies work together to calm overactive brain cells. Because it works to encourage sleepiness, passion flower is known as a mild sedative. Passion flower is chock full of antioxidants such as vitexin, isovitexin, kaempferol, quercetin, rutin, apigenin and luteolin glycosides. These antioxidants have been shown to decrease fluid buildup, thereby reducing inflammation and easing chronic pain. Attention, Deficit Hyperactivity Disorder, has proven to be a rising concern among many children and teens in recent years. Conventional medicine, while potentially effective at handling ADHD symptoms, often cause more problems, and the side effects can outweigh the benefits. ADHD causes inattention and hyperactivity that must be managed to support a child’s healthy development. Passion flower is beginning to be used more frequently as a natural solution to this behavioral disorder, as it brings clarity and focus. Yellow passion fruit peel may help decrease insulin resistance in those with type 2 diabetes. One study showed a positive reaction to passion fruit as a supplemental option to conventional methods of blood glucose control. Passion flower may prove useful for those suffering from mild hypertension. A study performed on lab rats with hypertension showed that the high levels of GABA in passion flower extract was beneficial in reducing blood pressure levels and removing toxins from the body. Used in tandem with clonidine, passion flower can be helpful in increasing this drugs ability to ease symptoms of narcotic drug withdrawal. Including irritability, insomnia, and flighty behavior. Though it is generally considered safe for most patients, passion flower can interfere with other medications. If you are taking any prescription drugs, you should consult with your healthcare provider before starting passion flower. This list of side effects is not exhaustive, but if you begin to feel any of the below symptoms or experience other health issues while taking passion flower, discontinue use immediately. Avoid passion flower if pregnant or could become pregnant as it can cause contractions. Passion flower can affect the central nervous system and interfere with anesthesia. Do not take right before surgery. Always talk to your doctor before starting to take passion flower. Passion flower can be used effectively in many different forms including tinctures, dried herbs, capsules, teas, infusions, and liquid extracts. The way you use passion flower will somewhat be determined by the health benefits you seek to receive, and the potency with which you desire to ingest this herbal remedy. Drinking a warm cup of passion flower tea 1 hour before bed can do wonders for the quality of sleep and can promote a healthy time of unwinding and relaxation before retiring. To make this tea, simply steep 1 teaspoon of dried herb in 8 oz hot water for 1 minute before straining out loose leaves and enjoying. Or for those wishing to add a little extra flavor, try this delicious tea recipe. Add ingredients and cover with lid. Turn off heat and allow to steep for 10 minutes. You can also try chilling passion flower tea and adding it to any smoothie for a quick and easy breakfast. This is helpful for those struggling with anxiety as it can soothe your mind, give you clarity of thought, and prepare you for the day. It may also relieve anxiety when 45 drops of a liquid extract are taken daily or a capsule with 90mg of passion flower on a daily basis. Passion flower essential oil can also be helpful when used topically. Apply 1-2 drops to your pillow before bed or to a warm bath to receive full relaxation benefits. To use passion flower for any of the other benefits mentioned above, look for it in capsule or extract form in most health stores or online. The flower of the passion vine is a delicious addition to salads, while the fruit can be used to make jams, jellies, syrups, or even wine. Overall, passion flower could potentially be the solution you’re looking for in regards to natural healing. Take time to understand your body and give it the care it needs by drinking a piping hot mug of this relaxing remedy. Though much of the evidence in regards to its health benefits have yet to be supported scientifically, passion flower is quickly becoming an herb of interest in mainstream medical avenues. Whether you’re growing it in your garden to bring a pop of color or are taking supplements to relieve anxiety, passion flower won’t disappoint! Always, be sure to consult with your doctor before using passion flower.